Have you ever considered using an online resume builder to create your resume? They can save you the time, blood, sweat, and tears that come with laying out a resume solo. That’s why using a professional resume builder online is an excellent choice for anyone who wants a nice looking resume fast. But which online resume builder should you choose? Well, that’s harder than it sounds. Some have amazing resume templates but cost an arm and a leg. Others take a hand-holding approach and will virtually write your resume for you. This article reviews 12 of the best resume builders online. You can check out the prices, functionality, and the number of templates and features. And that way, you can choose the one that best fits your needs. 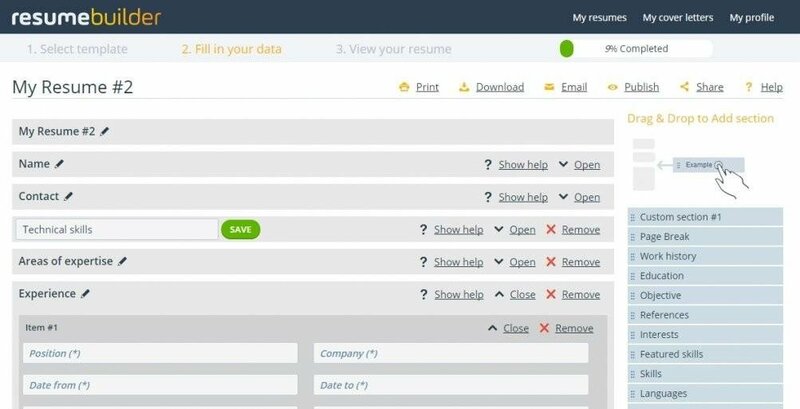 Zety is our online resume builder app. So, we aren’t going to review ourselves as that would be self-promotional. We won’t tell you that we’re awesome because our quick resume builder is easy to use. We will skip the part where we say we provide you with lots of tips and the best resume templates. No. Instead, we will just encourage you to see for yourself. Go ahead. Try out our professional resume builder online. See 20 other resume templates and create your resume here. Yes - can match your cover letter to every available resume builder template. You can make your resume on Resumonk’s online resume builder either for free or for a yearly fee of $19. That makes it one of the cheapest CV makers at just over $1.50 a month. You can move resume format sections around as you see fit and use the writing tips inside the platform. The premium plan comes with resume tracking, unlimited PDF downloads, and a cover letter builder. The professional CV builder has an easy-to-use interface. Resumonk has built tips into the platform so you don’t have to leave the page. Using the resume builder for free means getting branded resume builder templates and the ability to download your resume format as a PDF. 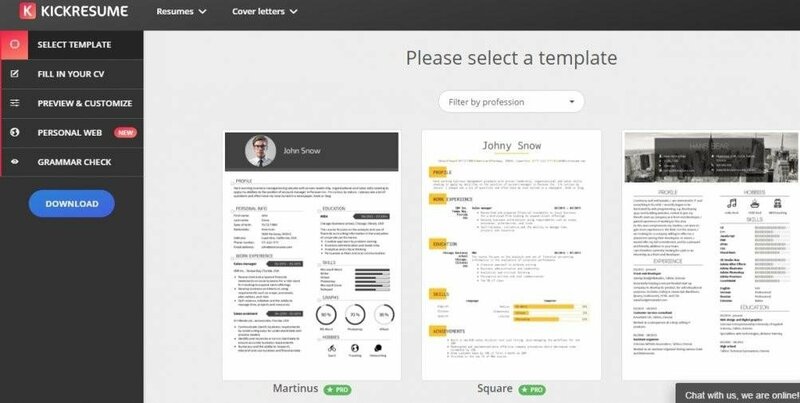 SlashCV is a free online resume builder with 28 basic, pre-designed PDF templates. Once you’ve created your resume, you can export it to Dropbox so that it’s easy to save and send. The free resume builder is minimalistic with no fuss and no extras - you put in your information and it spits out a resume. If you’re looking for a resume builder free download with no bells and whistles, this is it. 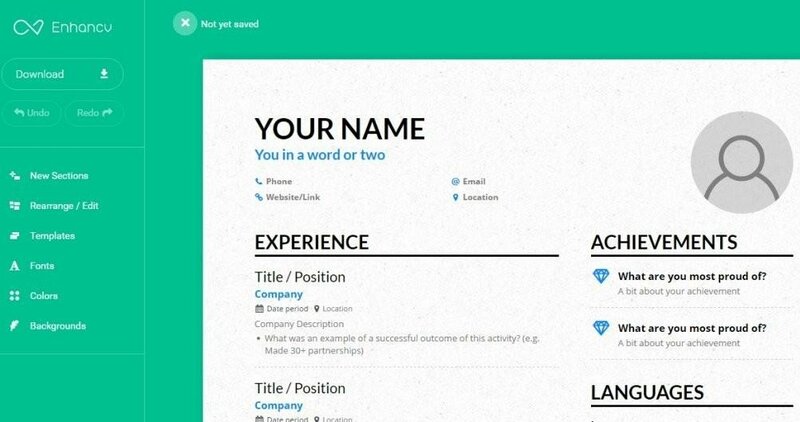 SlashCV is scaled-down and has slashed its online resume builder down to the basics. A lot of features don’t exist here. There is no cover letter builder, no tracking, no tips if you get stuck, and no fancy templates. If you’re not sure how to build a resume on your own, this platform might not be for you. To start, you have the option to import your Word or LinkedIn resume. Or you can choose a pre-written resume from your field. Or maybe you’re feeling like a boss? Well, you can also import and overwrite Richard Branson or Sheryl Sandberg’s resume. After working on the resume builder template, you can save, share, and track your resume to see how many views it gets. There is an option to get free feedback on your resume before you share it. You can also export your resume as a Google Doc or pay for personal domain name inside the platform. There are no tips inside this online resume maker. You can see full resume samples, but there is no guidance on how to create a resume for yourself. Cvmaker gives you two choices. A basic text editor for free, giving you a printable resume template. Here you have the option to move sections, add sections, and add your information with no fuss. Or a paid version that upgrades you to a more advanced rich text editor with more resume fonts and colors. Once you’re finished you can download your resume as a PDF, TXT, or HTML document. 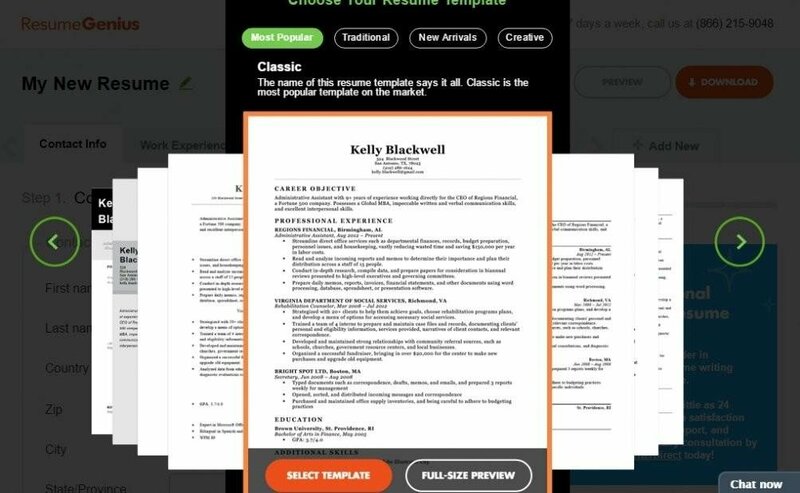 Cvmaker is a simple, free tool that saves you from choosing a resume format. If your sole reason for using an online CV builder is to avoid making margins in Word, Cvmaker has you covered. There are no tips inside this online resume generator so you’re on your own. Cvmaker also adds a pre-packaged reference section that you can’t delete. It comes complete with the phrase “References available upon request.” (You can delete the phrase.) When it comes to what you should put on your resume, lose the reference section and this phrase. You can tell that a lot of design work has gone into Resumup’s templates. Using creative resume builder templates is a way of making your resume unique. Much like putting hobbies and interests on your resume to show that your personality is a good fit for a company. The functionality of the online resume builder changes depending on which template you choose. Some templates allow you to fill in blanks and others don’t. 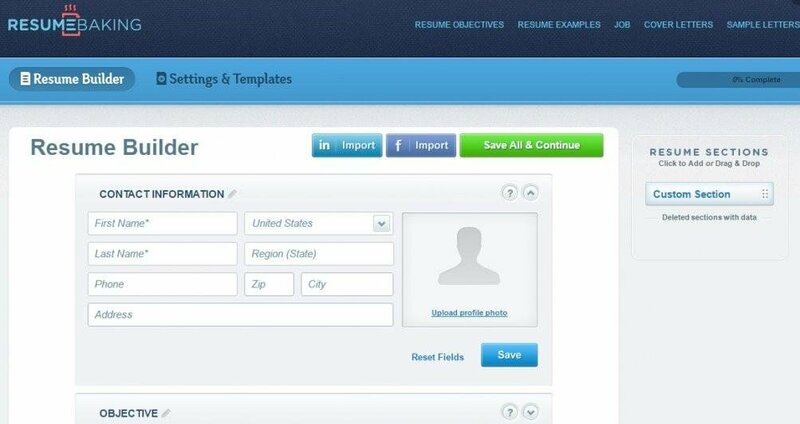 With Resumup, it’s important to get attached to a resume builder template. After all, that’s what you’re buying here. Two templates are free. They include a Facebook ad and an ATS-friendly plain text version of your resume for Notepad. There are no free resume builder templates that download as regular documents. Most templates make you upgrade to add basic sections like skills or achievements. Premium version only. Not for all resume builder templates. The CV creator has a lot of fancy templates including an infographic template. A lot of them are also mobile friendly. So, if you want a resume that stands out, you’ve got options. A lot of these resumes have heavy design elements. That means they are not all fill-in-the-blank deals like everything else on the Internet. It’s best if you’re savvy at manipulating graphics. Otherwise, you may find the functionality on this online CV builder a bit challenging. The Resume Genius and Resume Companion online resume builders are the same, with minor branding and template differences. Choose a resume builder template to get started. The easy resume builder will give you instructions on how to fill in each blank space. You pay at the end before downloading your resume. You’ll want to be careful. Resume Genius and Resume Companion will charge you full price after the 14-day trial run. The easy resume builder gives you prompts and tips as you go along so you know what to put in each space. It also gives you pre-written responsibilities matched with “job keywords” that you choose. You can’t leave fields blank when you’re working on a section. The resume wizard will prompt you to fill them in before allowing you to move to the next section. So, you shall not pass without filling in the blanks. Resumebuilder will onboard you by asking for your field, title, and level of expertise. Much like the Myperfectresume platform. Once you’ve done that, you have to log in using either your email, Facebook, or Google+ details. Yes, they’ve integrated Resumebuilder with Google+. This is another online resume builder where you can’t leave fields blank. The resume generator will prompt you to fill them in before allowing you to move to the next section. The online resume maker includes tips. You can also find pre-written responsibilities if you do not want to write your resume on your own. The resume generator is great for Google + enthusiasts, who can log in with their account. The CV builder asks for a lot of information. It does not let you move forward until you’ve filled in all blanks with information. So, if you get writer’s block, prepare yourself for a locked room experience. Resume Baking - “a resume builder that’s easy as pie.” This is a free resume builder, and it’s the only free online resume builder accompanied by a free cover letter builder. You can import information from LinkedIn and Facebook. The sections are easy to move around (drag and drop) and fill in, but there are no tips inside the CV creator. Instead, there are lots of resume samples, objectives, and cover letters. You choose your template at the end. You can share your resume across various social media (Facebook, Twitter, LinkedIn, and Google+). The site will tell you how many views your resume has. Resume Baking is the only free resume builder online that lets you write cover letters. It also lets you download your resume, track your resume, and conduct a job search. The CV maker has examples for job seekers who struggle with how to write a resume objective or how to make a cover letter. The resume builder free and paid templates use colors, fonts, and layouts that may not be appropriate. 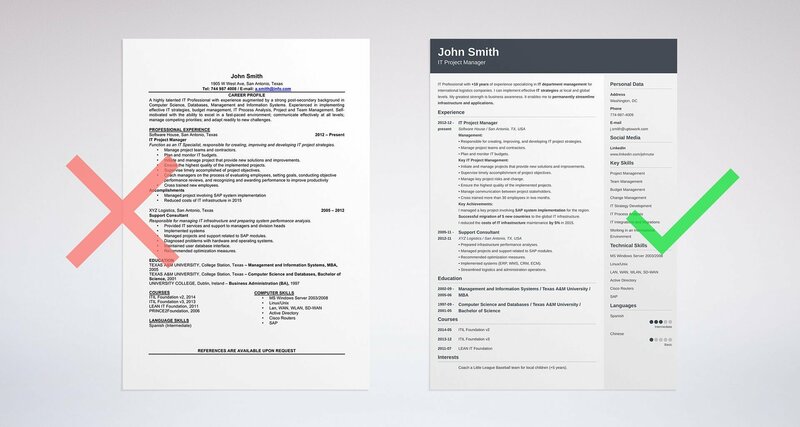 Try to match modern resume templates with the type of job. Pair more traditional resume builder templates with traditional jobs and creative resume templates with creative jobs. 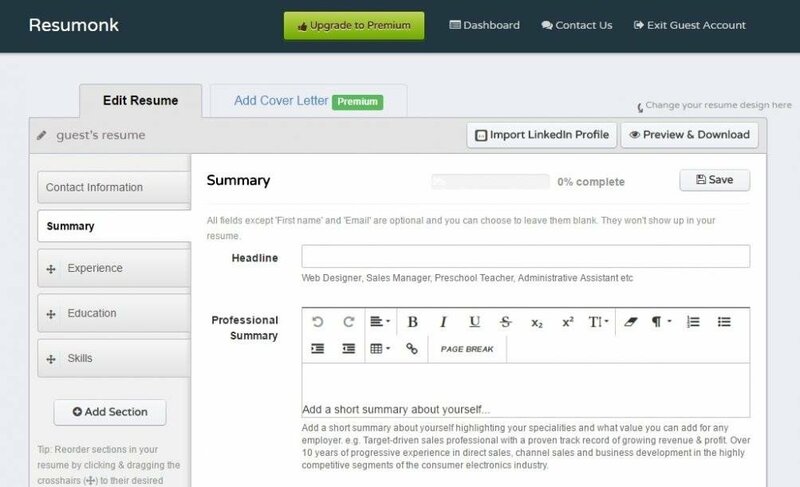 Starting from the dashboard, you’ve got the option to create a cover letter or a new resume. The cover letter is already written for you. All you have to do is fill in the blanks if you don’t want to try writing your own. The easy resume builder is straightforward and provides you with tips. The service is free of charge—you can download your documents in PDF or DOC. The easy resume builder’s functionality is straightforward. Once you’re done, you can save your resume as a PDF and as a Word doc. Though the selection of templates is relatively wide, they're not very fancy looking. It's a good place to create a basic, standard resume though. 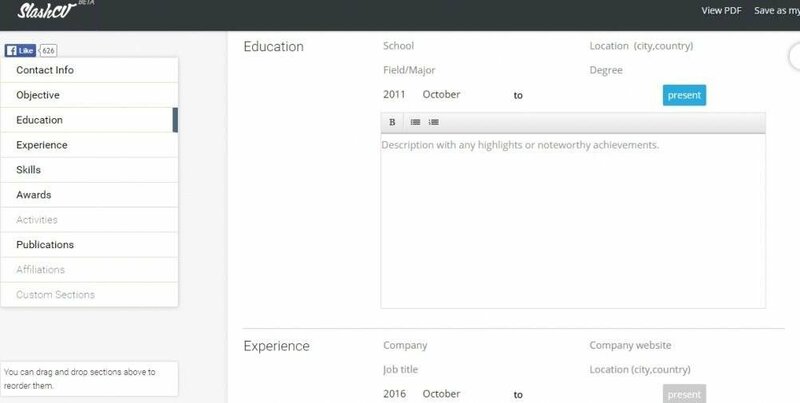 Enhancv will assign you a resume builder template based on your field and experience. You can’t choose your own adventure here. It is good about showing you what’s locked until you upgrade. So, you can see what’s on offer and not choose it by accident. The upgrade includes new colors, backgrounds, icons, and fonts. The idea is to let you can enhance your CV as much as you want. Free Version You can test drive unlocked features and download resumes for one month for free. One template with 2 unlocked layouts and one locked layout. Enhancv will soon add an option to customize your resume to individual jobs. 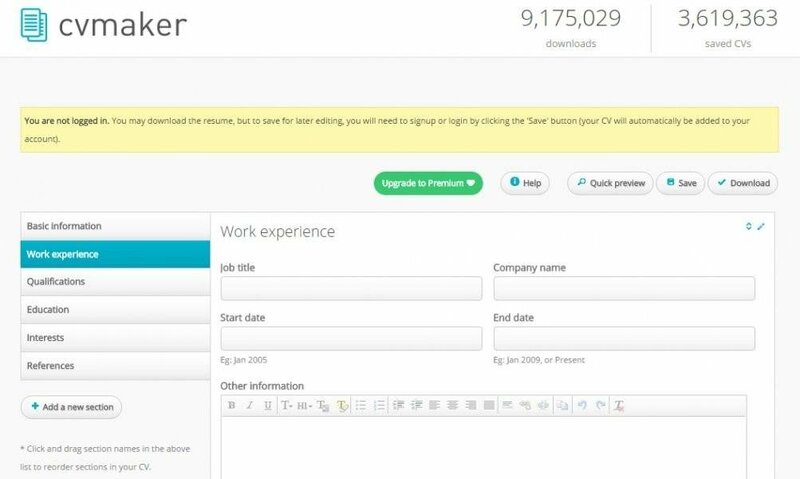 That way, you can tailor your resume to specific jobs inside the resume creator. Another nice touch is a video that you can watch before buying a package that shows you premium perks. Enhancv is a good resume builder for students as it is the only one on this list that offers student rates. You only have one pre-assigned resume builder template. If you don’t upgrade your account, you get a branded version. Kickresume kicks out the registration information. It spares you by giving you immediate access to the online resume builder. You choose your resume builder template and get started. You have the ability to chat with assistants in real-time as you go. Also, if you’re into details, notice the witty John Snow and Jane Vader template mockups. One of the only resume creators on the list that has a proofreading service. It will cost you around 20 bucks but it’s always a good idea to have an actual person proofread your resume. There are only five cover letter templates. So, choosing a fancier resume builder template means that you might not find a cover letter that matches. Choosing an online resume builder format is all about finding one that feels comfortable. The one thing to remember is that not all CV templates are good for all jobs. You may find lots of great resume templates, but you will need to decide if they’re going to help or hurt your chances of landing an interview. To succeed, you always need to adjust the format and design to your specific situation and the job you're applying for. Unfortunately, even the best free resume builders don't have enough features to let you create a truly outstanding resume or CV, so consider a paid one. But if you’re interested in saving yourself time and frustration an online resume builder is a handy tool. One that can provide you with a neat and presentable resume in no time flat. Not sure how to match the design of your template to your profession? We can help! Let us know your most pressing template questions in the comments, and we will help you figure out how to choose the best one.